This post has 2,530 views. It’s November already, which means the 5 months of winter is about to begin here in the Northeast. In the last two months though, I have been using my weekends to enjoy the great outdoors during the autumn season. 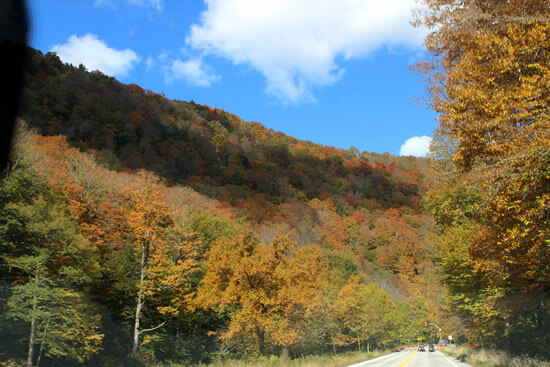 The temperature during the fall is perfect since it’s not too hot and cold, and more importantly the Northeast is known for its beautiful fall foliage. This post basically summarizes a bunch of my fall season outings with a good amount of photos. Most photo credits go to my various travel buddies, since they are the ones who have the nice DSLRs. When you talk about fall foliage in the Northeast, Vermont is probably one of the first places that gets mentioned. 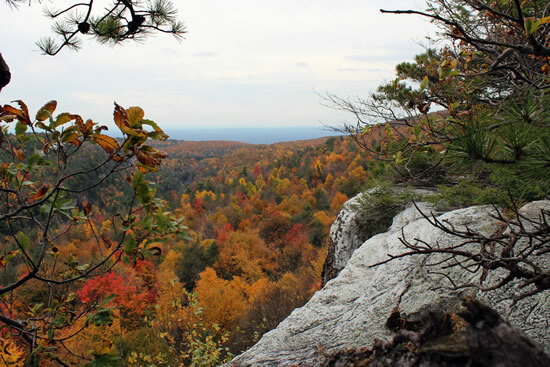 The state has the right combination of climate, terrain and forests to provide radiant fall colors starting late September. A couple of friends and I took a weekend road trip into the state to enjoy some early fall foliage. We drove up the famous Highway 100 through the Green Mountains and passed by many of the state’s ski resorts. The highway is very scenic as there are either mountains or trees on the side of the road. Even though it was early in the foliage season, the colors are already vibrant. 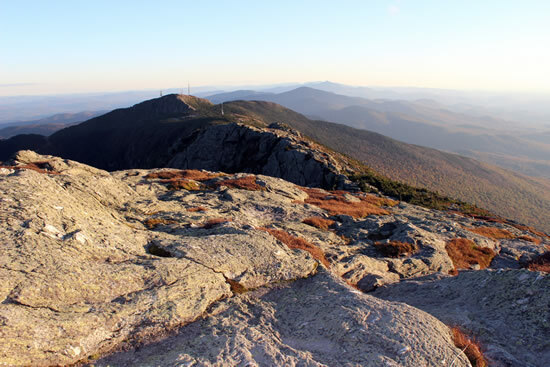 We drove all the way up to Stowe, VT in order to climb Mount Mansfield, which at 4393 feet above sea level, is the tallest peak in Vermont. We approached the mountain from the east through the ski resort and up through the Haselton Trail, and across the mountain ridge and down through the Long Trail. The hike was a bit tougher than what we bargained for, as both the climb and descent were very steep, and there are some wet and slippery spot. There was a particular portion on the way up where we had to walk up a single black diamond ski trail, and that was very tiring. The entire 6 mile hike took us about 6 hours, and our legs were completely shot the next day. The view up on the mountain ridge was beautiful though. To the east we see the ski resort and more of the Green Mountains, and to the west we can see Burlington Vt and Lake Champlain. 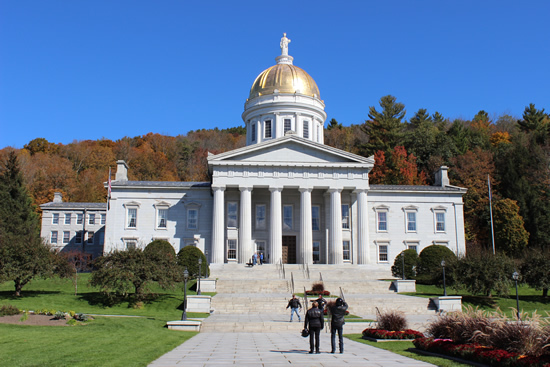 Vermont’s State House with the golden dome. On the same trip, we visited the state capital of Monteplier. Montpelier looked like a beautiful small city, and the fall colors and great weather certainly livened things up. We didn’t stay for long, and mainly just walked around the State House. 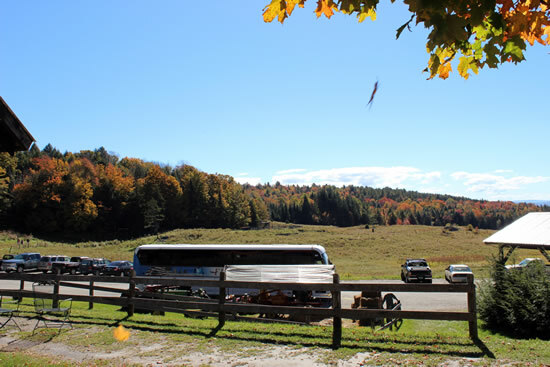 Other than fall foliage, Vermont is also known as a producer of maple syrup, and so we headed to a maple syrup farm to taste and buy some Vermont syrup. The view from the maple syrup farm is pretty nice as well. Upstate New York has plenty of fall foliage as well. 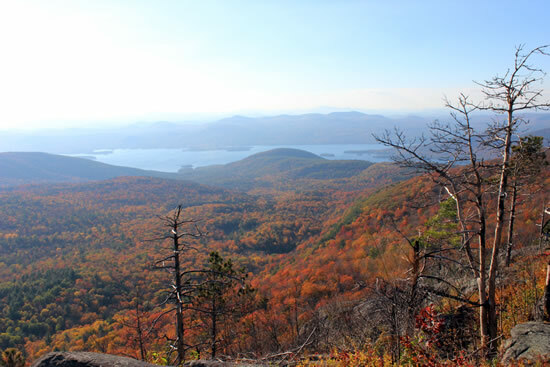 On a weekend, a group of us went to hike the Sleeping Beauty Mountain near Lake George. The foliage were at their peak, and the view from the top of the mountain was absolutely gorgeous. The hike was a relatively easy 3 mile hike, and the climb wasn’t too steep as the trail had switchbacks. To be honest, the trip was harder on my car then it was on my legs, since there is an uneven dirt road between the Hogstown parking lot and Dacy Clearing where the actual hike starts. 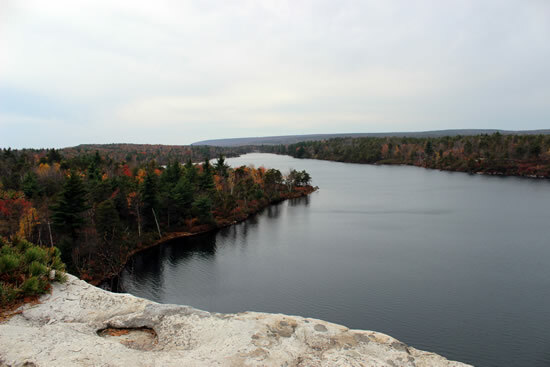 Grey skies cannot hide the brilliant fall foliage at Minnewaska. 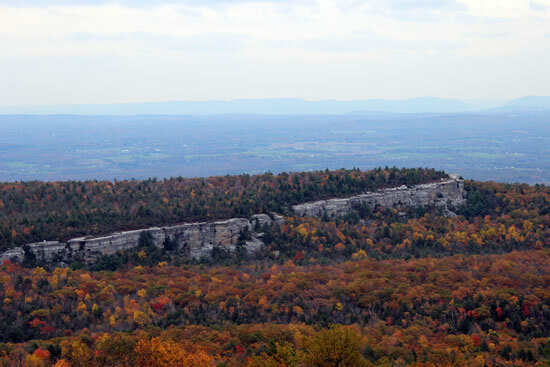 Another place I went to view the fall foliage was Minnewaska State Park Preserve, located not far from Poughkeepsie, NY. 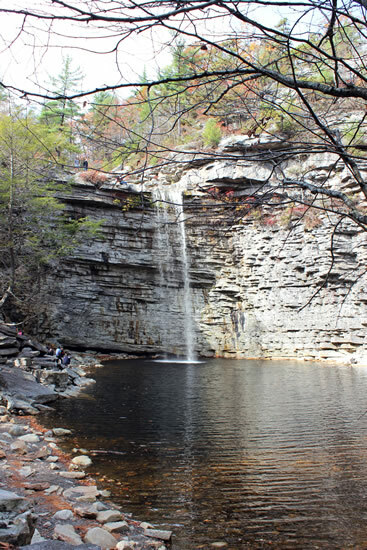 Located on the Shawangunk Mountain ridge, Minnewaska State park features waterfalls, lakes, dramatic cliffs and lots of forest. It’s pretty big for a NY state park, and my group took a loop hike that was about 9 miles in total. This is the longest hike I’ve ever been on, but it’s not the hardest since the carriage trails in the park are well maintained and there were only gentle climbs. The weather wasn’t cooperating that day and it was overcast, but even the grey skies cannot hide the brilliant fall colors seen in some parts of the park. At other parts, the foliage was past peak and a lot of the leaves have fallen. Arrive at Lake Awosting about 5 miles into the hike. 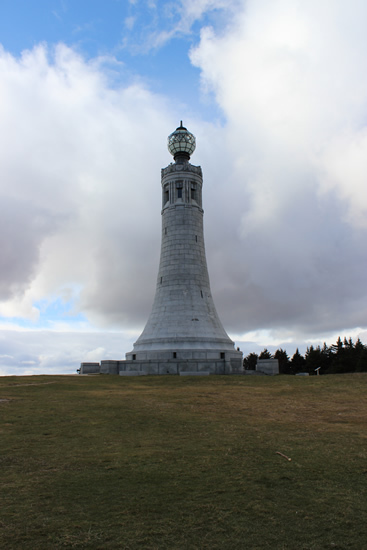 I conquered another state high point by visiting the top of Mount Greylock, the tallest peak in Massachusetts. Of course, the peak is only 3491 feet above sea level, and I drove up to the peak in my car. There is a system of well-maintained hiking trails, but we didn’t feel like walking that day. 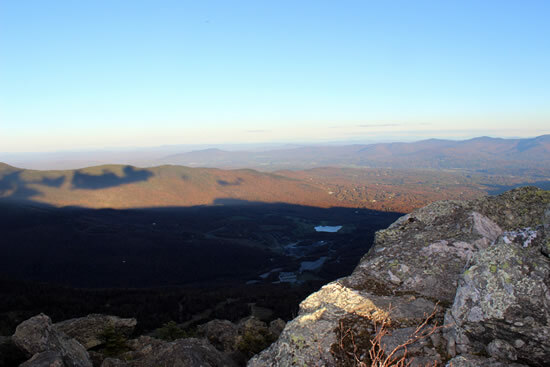 In the Taconic Mountains where Greylock is located, most trees have already shed their leaves, but the view from the top of the mountain down into Adams, MA is still very scenic. On the summit there is a war memorial, along with a shelter and the Bascom Lodge that opens during the warmer months for dining and lodging. We didn’t stay on the summit for long though, as by that weekend the temperature have dropped, and with the high winds it was a little too cold for our tastes. 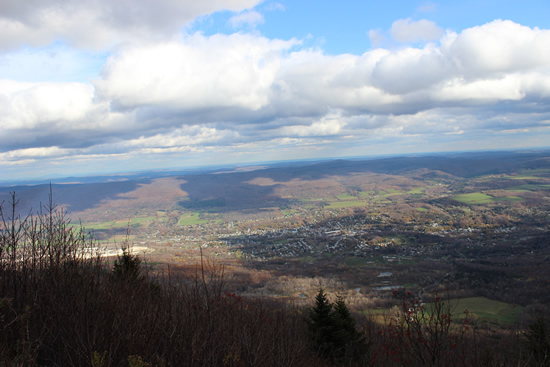 The view from Mount Greylock to one of the towns down below.